Is there anything worse than missing a short putt? The kind that you make 90 or even 99 times out of 100 on the practice basket? Usually when that happens we know even a split second before the disc leaves our hand that we’re in trouble, and that says most of what we need to know about why we occasionally miss ridiculously short putt, and how to make sure it almost never happens. Let’s touch on the mechanical issues first. Based on personal experience and what I see out on the course, the most common technical flaw that causes missed short putts comes from how some players change the putting stroke to adjust for shorter distances. Quite often players will try to ‘take something off’ their normal putting motion in an attempt to putt softer or simplify their form. That usually results in changes to the finish of the putting motion, and it’s exactly the wrong approach. All too often that approach results in putts missing low, high, left and right. Instead, to accommodate short putts that require less power, reduce movement in the front-end of your normal putting technique. Ways to do this include using less lower body, not pulling the disc as far back (my favorite), and reducing the amount of armspeed as needed. But whatever you do, keep the form of your finish as consistent as possible- especially your follow-through. The most important part of a good, consistent putting stroke is the finish. Specifically, the follow-through. 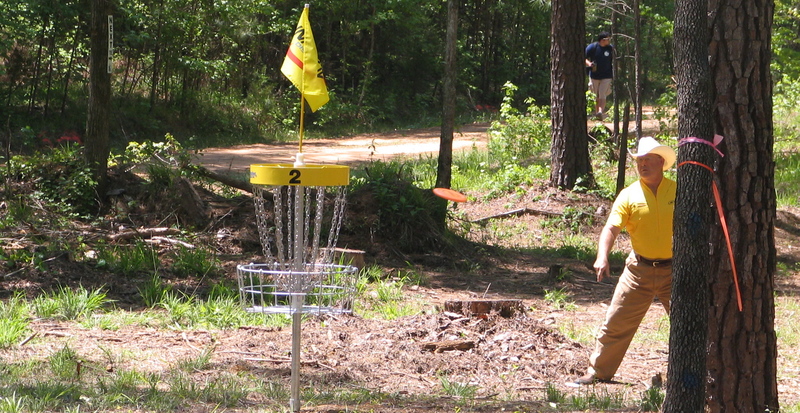 Good follow-through ensures that a player’s disc goes where it is being aimed (assuming the follow-through ends up pointed at the spot being aimed for). Check out this video tutorial demonstrating a great exercise that helps develop proper follow-through. A good definition of follow-through in this context, by the way, is ‘continuing the putting motion even after the disc leaves your hand’. Take a look at pictures of top players putting, and you’ll see arm and even fingers fully extended at the target, usually rigidly straight, even when the disc is 10 feet out of the hand. That’s good follow-through. Good, balanced follow-through eliminates most short misses. Follow-through also adds a surprising amount of oomph to putts, and with short putts that can make the difference between hitting the front rim and just clearing it. In fact, the idea to write this post occurred yesterday during a crisp -11 at my local course, Black Mouse. I had an 18-foot putt on hole 11 for birdie, and at the very last second I realized that I wasn’t giving it enough power to go in. I was able to exaggerate the follow through even more than usual, and that made all the difference as it barely cleared the front nubs. 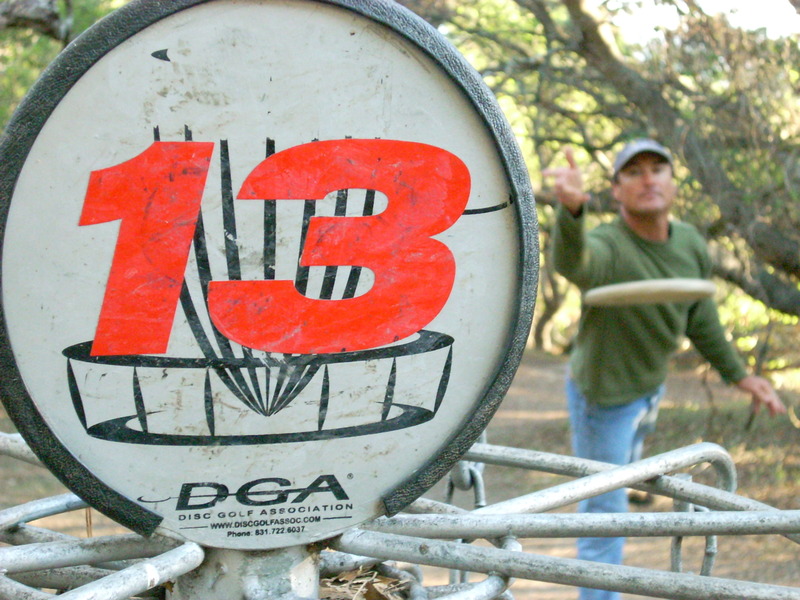 Follow-through also helps eliminate misses to the left and right, and also putts that hit the top of the cage. Going back to the first point made about the problems caused by making changes to the finishing part of a putt, lets look at some specifics. When we do that, we’re really just guessing on a case-by-case basis, and the results are unpredictable. Early releases turn into misses on the weak side of the basket, and holding on to the disc too long causes players to ‘pull’ the disc and miss on the strong side. And everyone at one time or another has launched a short putt at a sharp upward angle and hit the top of the cage. %!#!*^!!! The cure for all of these- really all mechanical flaws in short putts – is to keep the finish of the putt the same no matter the distance, and follow through the right way (and the same way) every time. This is true of all putts, but especially short putts, and the reason is simple: If you putt firmly and follow through at the center of the basket, the disc won’t have enough time/distance to stray off line. The firmness of the putt (it just needs to be hard enough that it flies on a straight line) is important as well. If you are a finesse putter, you still don’t want the short ones to have any curve or turn. With a firm, accurate line, even if you’re off a little with your aim, good follow-through will ensure that the disc bangs the chains before it has a chance to veer too far. One final note about follow-through: Balance is a key to the aiming part of follow-through. If you’re not well-balanced and tend to fall or lean to one side or another as you release the disc, good follow-through won’t help much in terms of keeping the disc going in the right direction. Now let’s examine the short putts that are missed due to mental lapses and neurosis. These are at least as frustrating as those caused by mechanical flaws, and luckily they are also just as preventable. When I say ‘mental lapses’, I’m referring to those times we take for granted that we’ll make a putt of ‘gimme’ distance (which is different for everyone). Without even making a conscious decision to do so, we switch to autopilot and go through the motions while our brains are occupied with something completely different. Then we miss the putt and become immediately and painfully aware of the 100 percent preventable mistake we just made. The cure for this kind of lapse is to have a putting routine and go through it on every putt in every round you play, whether practice or tournament, casual or for stakes. Once again I refer to those top pros who depend on the money they on tour to be able to stay on tour. Watch some tourney videos and you’ll see nearly all of them take a little time on even the shortest putts, knowing that each throw counts the same and each throw could directly impact their payout. The other mental error that causes missed short putts is something I write about often- getting wrapped up in and dwelling on the ‘why’ of the putt rather than the ‘what’. In other words, thinking about why the putt is important, or why you can’t afford to miss it rather than simply what you need to do to properly execute. For one thing, negative thoughts lead to negative results, and even if the ‘why’ isn’t purely negative the fact remains that you can’t think about two things at once. And thinking about the ‘what’ is essential. Confidence – or the lack thereof – can make all the difference on short ‘tester’ putts. There is a certain distance putt (and the exact distance differs depending on each player’s skill and mentality) that is longer than a gimme but short enough that it’s a big disappointment if missed. When someone in our group is left with one of these, my friend Alan likes to say “there’s still some meat left on the bone”. Most players refer to these putts as ‘testers’, and they can mess with your head like no others if you let ’em. Have you ever seen a movie with a dream sequence where a character looks down a hallway, and the end of the hall keeps stretching further and further away? In disc golf, this translates to testers that we really should make at least 80 percent of the time morphing into final exams that we forgot to study for. I have to admit that when my putting is a little off, these can really get to me. The problem is that when this happens my anxiety shifts my focus away from where in needs to be – on the ‘what’ – and at that point I’ll be lucky if the putt even accidentally goes in. So what’s the remedy? First, be cognizant of those anxieties creeping into your head. Acknowledge that they’re there, then step back and re-focus. When it happens to me, which is usually, as I said, when my confidence is on vacation, I remind myself to trust the routine and technique. At times like that it’s usually a blind trust as I’m just not feelin’ it at all. But it almost always works, because after all, these testers are putts I should be making without too much trouble. By shifting my focus back to the routine I’m dissipating the doubts and anxiety that would otherwise derail me. Missed short putts are almost always avoidable, which is why it stings so much when it happens. Hopefully the tips above can spare you some of that angst. And when that short miss eventually does come along (it will, it happens to all of us), instead of just getting disgusted with yourself, consider it a reminder of all the ways to prevent those mistakes in the future.